Inspection of work at various phases of permitted construction to help ensure compliance with construction code and permit requirements. The Building Safety Division also enforces the City’s Sign Code regulations through review and approval of sign permit applications and inspection of permitted signs. Information about general building safety, building safety frequently asked questions (FAQs), current issues/topics in building codes and construction, adopted City building and trade codes, building permitting processes, building permit inspections and procedures, and contractor licensing are available on this web site. Permit applications, forms and code/design guidance documents are also included. An interactive building permit map and search queries for building permit records and licensed building/trade contractors can be found on this website, as can various monthly and annual building permit/building permit trends reports. City of Lawrence contractor and trade licenses must be annually renewed by December 31st. To renew, the qualifying party for a contractor license must obtain at least 8 hours of related continuing education annually that meet the City’s criteria for approval; licensed tradespersons must obtain at least 6 hours of continuing trade education annually that meet the City’s criteria for approval. Click on the link below to find the current list of approved continuing education classes. Watch this real life story on how safe rooms save lives. Make sure your deck is safe by knowing the five warning signs of an unsafe deck and how to build and maintain a safe, strong deck. Search our database of contractors currently licensed by the City of Lawrence to provide building construction services. 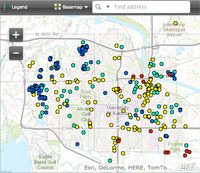 View the interactive map of active building permits.